A few things to report regarding development and progressions with Mole Majority. Generally speaking, the game is set and only minor tweaks have happened in the past several months. I'm looking for a publisher for this game, and as I haven't heard back from my first contact in more than six months, I figure it's time to press on to others. 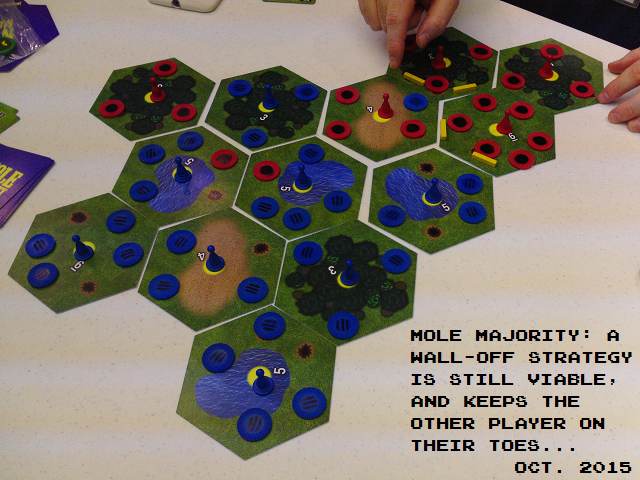 Thanks to a contact here at BGDF, I was able to arrange for a blind playtest of Mole Majority earlier this year. The game was well-received, moreso than I expected. My contact explained that it "was the highlight of the day," which is as great a news as I could ever hope to hear! There were some questions about the special effects - notably Cave-Ins and the newer Gopher It! card, so I've since tweaked and clarified them in the ruleset. I was very grateful for the opportunity for Mole Majority to be seen with completely fresh, independent eyes and receive such a favorable reception. The playtesters all reported they'd consider picking up the game for a $25 - $30 price point, which is comforting to hear. Earlier this month, I attended EuroQuest game convention here in Maryland. As part of Unpub I represented Mole Majority in the UnPub ProtoZone, a separate hall to show games seeking publishers. Although I may have been dismayed by the low attendance (while also overhearing long-time attendees and staff remarking that event attendance in general this year was lower than in years past), I had some quality sessions with other designers and a good friend of mine who was in attendance at the event with me. - The Cave-In function now allows players to choose one or two barriers to implement, instead of only two. This was also suggested by the blind playtesters earlier in the year, and I was happy to make the change. Each player is still limited to four barriers, but that is still plenty to work with. - Player elimination: To sum up, I don't like this, and want to remove it from the game. To start, I will implement a home hex for each player that cannot be claimed by their opponents. Additionally, if they lose all their moles in this hex, they won't lose control of this hex and can repopulate this on successive turns. I will need to do some playtesting to ensure how this won't be exploited in some way. We'll see how it shakes out. - I've formalized the procedure for the Gopher It! card. The active player plays Gopher It! against an opponent. They choose any card they want from the opponent's discard pile, and add it immediately to their hand. The Gopher It! card goes immediately to that opponent's discard pile. Next, the active player enables any stackable bonuses they have, including the Gopher It! and any other cards they want to stack. Finally, the active player draws one card to end their turn. This is all clarified in the new ruleset. It also adds relevance to the Gopher It! as having a captured card sent to the active player's discard is much less powerful and relevant. There's always been a significant change in strategy from two player games versus even three- or four-player games. One strategy that was tested was the "wall-off strategy" for a lack of a better term. To sum up, a player sets up their territory in such a way that they have three (or more) high-point hexes, then walls off the area so that their opponent has to work hard to infiltrate. Meanwhile, their card strategy consists of using Gopher It! to steal their opponent's Groundskeeper cards, allowing them to make several attacks, cycling their deck of cards via hand-discarding to maximize the number of times the Groundskeeper appears. This game type is an intellectual work-out, for certain - at least for the targeted opponent (to which I can attest, as this was a first-hand experience for me!). The attached photo details the end-result of such a game. Since the end-game condition at this point is claiming all the hexes, the walled-in player can use their Convert! cards to make forays into their opponent's territory, expanding and plundering as needed to claim territory as the end-game nears. 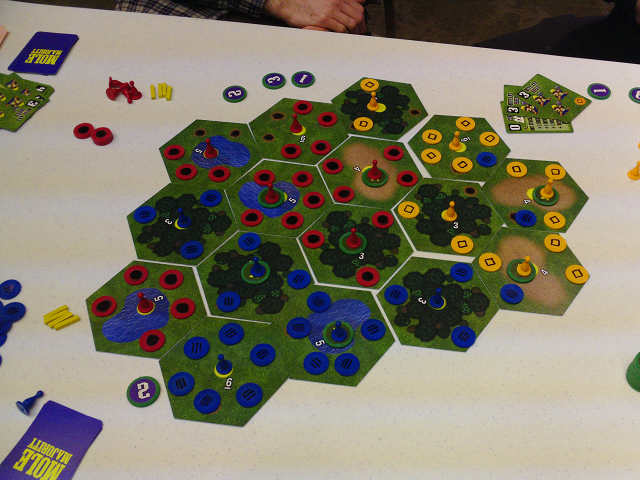 In the example pictured, the walled-in player was able to set up a claimed hex just outside their home-base barrier and then quickly expand to claim a few low-point hexes before I was able to usher in the end of the game. I'd say "wall-in" is an advanced-level strategy. Also, based on the results of this playtest and discussion afterward, it remains a valid, if unconventional, strategy to attempt. The multiplayer game still maintains its "three act structure," with competition for space escalating with all manner of attack moves building to a tense, engaging climax at the end when the final hex is claimed. Again, I will need to do more playtesting to gauge the effect of no player-elimination but I'd surmise the core engagement of the game and variety of general moves is still preserved. I'll be showing this game at a local game designer's event in early December.